Could it join exclusive club? 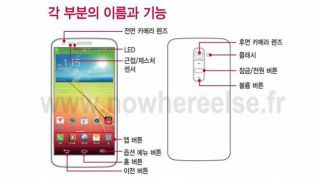 A leak today showed that the LG G2, the Korean company's next flagship phone, will use next-gen nano-SIM technology. This tidbit materialized in the form of an allegedly leaked product manual on the French site NoWhereElse.fr. The manual also seems to reveal that the G2 won't have a fingerprint scanner, which was previously speculated. But back to what it will include: It looks like the G2 will sport a microSD slot and a removable 2610mAh battery. The G2 is LG's next flagship phone, and although the firm dropped the "Optimus" from the name, it's still very much the follow-up to the Optimus G.
Other rumored specs for the G2 include a 5.2-inch 1080p display, rear-mounted volume controls, and a Snapdragon 800 processor. With the smaller nano-SIM tech that was spearheaded by Apple last year LG might be able to keep that form factor thin, as well. If it does rock nano-SIM, it will follow in the footsteps of the iPhone 5 and Asus Padfone Infinity. The good news? We only have to wait until Wednesday to find out just what the G2 has in store. LG, Samsung, Motorola...everyone has a new device in the works it seems. What about HTC?